Systems Requirements for OEICs: M.S. Goodman and E. Arthurs,<$>Telecommunications System Applications for Optoelectronic Integrated Circuits. J. Crow, J.M. Jaffe, and M.W. Sachs,<$> Computing System Applications. Materials Growth:<$> C.W. Tu,<$> Molecular Beam Epitaxy with Gaseous Sources. R. Bhat,<$> Organometallic Chemical Vapor Deposition for Optoelectronic Integrated Circuits. S.F. Fang and H. Morkoi,<$> Lattice-Mismatched Heteroepitaxy. Devices Processing:<$> L.R. Harriott and H. Temkin,<$> Focused Ion Beam Fabrication Techniques for Optoelectronics. P. Vettiger, P. Buchmann, O. Voegeli, and, D.J. Webb,<$> Full-Wafer Technology for Large Scale Laser Fabrication and Integration. W. K. Chan and E. Yablonovitch,<$> Epitaxial Lift-Off and Related Techniques. State-of-the-Art Discrete Components:<$> J.R. Hayes,<$> Electronics for Optoelectronic Integrated Circuits. L.A. Coldren,<$> Lasers and Modulators for OEICs. J.C. Campbell,<$> Photodetectors for Optoelectronic Integrated Circuits. Optoelectronic Integrated Circuits (OEICs):<$> O. Wada and J. Crow,<$> Current Status of Optoelectronic Integrated Circuits. R. Bates, J. Crow, J. Ewen, and D. Rogers,<$> Scaling and SystemIssues of OEIC Design. R. Baets, D. Botteldooren, G. Morthier, F. Libbrecht, and P. Lagasse,<$> Modeling for Optoelectronic Integrated Circuits. T.L. Koch and U. Koren,<$> Photonic Integrated Circuits. J. Crow,<$> Packaging Integrated Optoelectronics. I. Hayashi,<$> Future OEICs: The Basis for the Photo-Electronic Integrated System. Index. Systems Requirements for OEICs. Materials Growth. Devices Processing. State-of-the-Art Discrete Components. Optoelectronic Integrated Circuits (OEICs). Index. Integrated optoelectronics is becoming ever more important to communications, computer, and consumer industries. It is the enabling technology in a variety of systems, ranging from low-cost, robust optical componentsin consumer electronics to high-performance broadband information networks capable of supporting video and multimedia conferencing. The requirements for producing low-cost, highly reliable components for deployment in these new systems have created a technology challenge. Integrated optoelectronics promises to meet the performance and cost objectives of these applications by integrating both optical and electronic components in a highly functional chip. This book provides an overview of this exciting newtechnology. Integrated Optoelectronics brings together a group of acknowledged experts from both universities and industry around the world to focus on a common theme of integration. These experts have reported not only on the state-of-the-art, but also on the physics and design experience that goes into implementing integrated chips and modules. This book is a cohesive series of articles that includes a discussion of the intimate trade-offs between materials, processes, devices, functional blocks, packaging,and systems requirements in a truly integrated technology. This integration encompasses electrical, optoelectronic, and optical devices onto monolithic or hybrid chips, and into multichip modules. 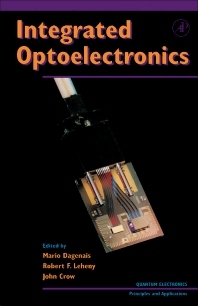 This volume surveys state-of-the-art research activities in integrated optoelectronics and gathers most of the important references into a single place. It outlines the major issues involved in integrating both optical and electronic components, provides an overview of design and fabrication concepts, and discusses the issues involved in bringing these new chips to the marketplace. Researchers in compound semiconductor and optoelectronic devices; electrical engineers in communications, electronics, and optoelectronics; and system designers in the communications and computer fields.